Patios with Dessert. Where to Indulge this Summer. These restaurants will make you want to skip right to the sweet stuff. This is the restaurant owned and operated by the Royal Canadian Legion in its brand new building in Kensington. The restaurant is on the ground level with the patio is tucked under the cantilever of the upper floor. The menu is mostly classic comfort foods, including this dessert of chocolate truffle cake with raspberry coulis. 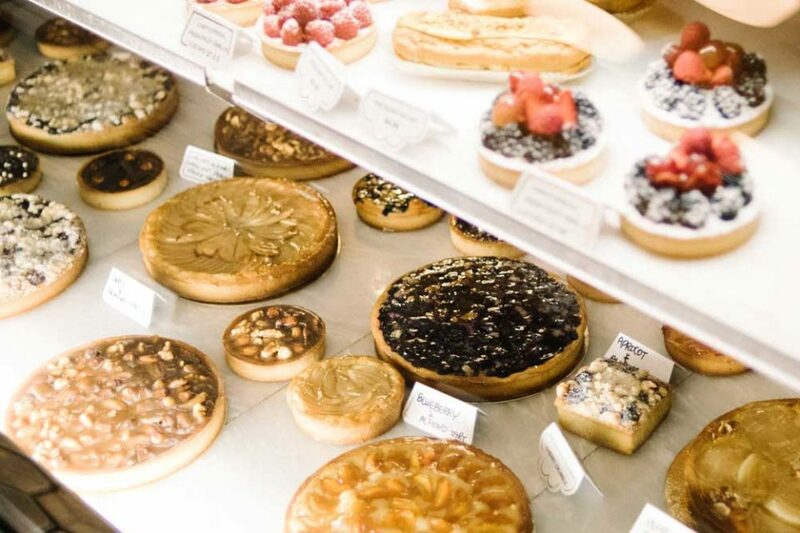 Alforno’s pastry case is full of tarts, cakes and other various sweets that you can take home or enjoy on its patio with a cup of coffee or glass of wine. The recent rotation of treats included these salted caramel popcorn macarons. The Beltliner embraces the diner ways by having a pie menu that includes apple, Saskatoon berry, pumpkin and a feature pie. One brilliant customer ordered apple pie with a side of bacon, which is genius and possibly trendsetting. You can’t go wrong with dessert at Blink. In fact, you might want to gather a few friends and share several. New menus are rotated in seasonally and summer brings some of the best. This is the strawberry dessert with sable breton, sesame ice cream and honey caramel. This dessert is a work of art with tropical flavours. It’s the passionfruit and coconut macaron with pineapple, coconut milk ice cream and passion fruit sabayon. It tastes extra delicious while sitting on a patio in Fish Creek Provincial Park. You might not think of Cannibale as a dessert destination, but the food menu at this cocktail bar is tight and everything is good including dessert. This is the Bulleit bourbon pecan pie topped with housemade vanilla ice cream. It will warm your soul as you sit out among the string lights of Cannibale’s patio. The Deane House is like the ultimate backyard patio with pretty views of downtown and the confluence of the Bow and Elbow rivers. This particular dessert is the cold pressed canola chiffon cake. It tastes like summer with meringue, lemon curd and rhubard sorbet. This bakery in Mission gives a tiny taste of French cafe culture. Order inside from the display cases of pastry and take your dessert and coffee out to the bistro tables on the sidewalk patio. The vanilla custard croissants are especially flaky and delicious. Vendome is another restaurant cafe with excellent dessert and baked goods. Get cake, tiramisu or a tart and pair it with coffee, wine or cocktails.